As my mother receives guests into her home and says goodbye to old friends, some deep questions poke to the surface of my conscious thought. What is this life that I so easily take for granted, this stretch of 80 years (if I’m lucky) from cradle to grave? Just now the morning sun glows in the curtains, dappling the floor in a play of shadows and light. In five minutes it will be different – but that’s only because my attention chunks time into snapshots for measurement and comparison. Actually, each moment opens a unique touch-point on reality, where the fluttering pattern of light and shade is continuous with yet utterly different from what it was just a moment before. How wide is a moment of time? Just a flash, a dissolving threshold? Am I not always in it – however wide or impossibly narrow it may be? This, right now, is the present because at this very moment reality presents itself to my awareness. As present, it is a gift that I can open or set aside for later. But if I should set it aside – out of intentional avoidance, preoccupation, laziness or on the promise that I’ll get back to it, it’s no longer there when I do. The past isn’t where the present goes. It’s only how I remember or try to recall what happened, a fixed snapshot in my album. I also spend a lot of time looking ahead, into the future, which is not the present coming to me but merely my mind again, chasing out the trendlines, flopping assumptions from over my shoulder and onto the path ahead. So whether I’m reaching back to recover the past or looking forward to predict the future, I’m doing all of it in the present. This won’t be here again. Yesterday I was hoping for something else, and tomorrow I’ll be wishing I could have it back. How many presents go unopened? What if the sun comes up tomorrow morning and plays in the curtains again – but I’m no longer here to witness it? It won’t be chunked and framed, and it won’t be around for me to remember later. What if I’m not around tomorrow? What if this day is my last? What if this moment is the final present I have a chance to open? Truthfully we can never know, can we? And that realization will either drive you insane with anxiety or call you to present-minded wonder and appreciation. If all there is is right now, then right here is where we need to start digging. Or maybe that’s already too willful and aggressive. Close your eyes and just relax into being. The opening of reality to me in this moment coincides with the opening of my attention to the present mystery – or perhaps they are really the same. This moment is for me in the sense that the mystery presenting itself is made present as I give my attention to it. But what am I supposed to do with it – this precious gift of time? I can’t simply gush all over it with sentimental acknowledgment of its fleeting character, grabbing up as much as I can before it slips through my fingers. Life can’t be lived perpetually in a stoned haze, gazing in stupefied amazement as it vanishes in wispy rings above our heads. Maybe it’s the “harsh realities” of daily life – all the deadlines, appointments, and concerns – that push me to an opposite stance, where I’m perfectly willing to squander the moment in distraction or worry. This could be what’s behind the worldwide tendency in religion to postpone what really matters to a later time, a distant paradise, on the other side. While the soul longs for authentic life now, mystical communion here, and deep peace in this moment, my ego-in-charge is too busy trying to hold its own and make progress against the steady drain of time. Having the assurance that I’m all set for life everlasting excuses me from fully investing in life here and now. What if this is all I have, my only “at bat,” my exclusive opportunity to open up to the Real Presence of mystery. Do you pity me? Please (and respectfully) save it for someone else. Today I will begin receiving guests into my life and saying goodbye to old friends, knowing that this may be our last or only chance to touch the divinity in each other. 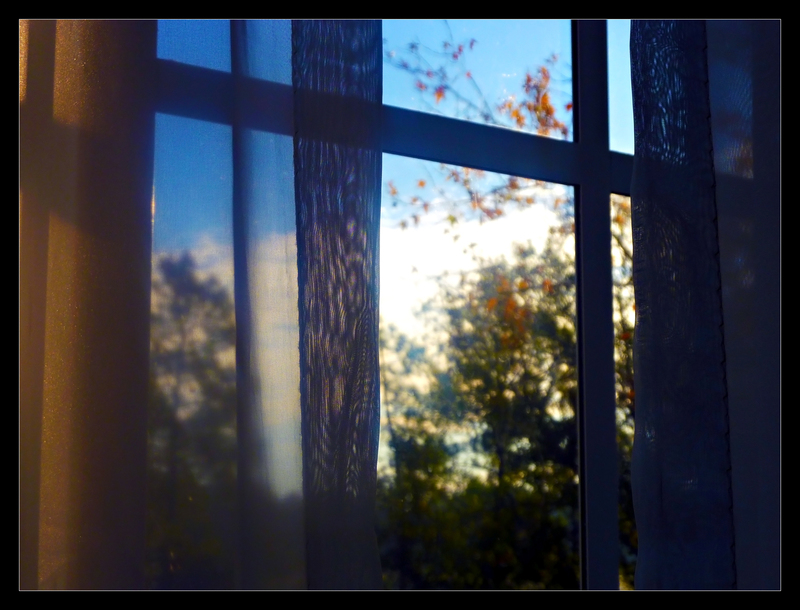 Tomorrow morning, if I am offered a gift of the sun dancing in curtains, I will notice, open the present, and give thanks. Nice, John. You are a skilled ‘Present Liver’. Enjoy the moment(s) over the next few days. This is very touching. I think most everyone has some regrets about what they may have missed in their lives; For some it might be regrets for not seeing a child/children growing up, being too busy with supplying a home, and income. For others, it might be choices for an occupation, the mate chosen. But, I think we cannot have any regret until the present has passed, and we realize we have missed something very important, something spiritual. We then have a choice, which you have made in your post, to move more into the present, be more aware. Sometimes the impending death of a loved one, can also make us more aware of what is spiritually important, and what is not, as we move through our lives and reflect on the memories to help us cope with the loss. Your thoughts are written so beautifully John. Thank you for sharing them with us, this difficult time for you and your family.